It came to me a number of years ago that one of the things I love about writing, is that when I go to the page I suspend judgment. In real life, I’m probably as judgmental as the next person, because that’s how we maneuver through the world. We just become judgmental, which is tiresome. We do and we are and yet, when I go to the page, I just don’t care. I just have an open heart for my characters and so it’s a wonderful thing. It’s very freeing and it allows me to just report on what people are doing. Because you know that’s my job – to show what we’re all up to or what some of us are up to. She loves her characters – all of them – and because of this, there is no judgment, there is no melodrama. Because melodrama is like good or bad. And in what I’m trying to do, I’m not interested in whether they are good or bad. I’m interested in the crevices of all those in-between spaces that most of us live in. This is what makes Strout’s characters so authentic, so intriguing. Her love of her characters is infectious. It’s why we care so much about Lucy Barton and her mother in My Name is Lucy Barton – two women sitting in a hospital room gossiping about the people of their hometown. It got me thinking about how we create the melodramatic in our own lives. For each of us, there are people who strive to create it on a daily basis. Years ago, I decided not to cultivate these relationships. I understood that manufacturing melodrama was unnecessary and exhausting. In living life, enough tragic events will find you. Enjoy peace while you can. 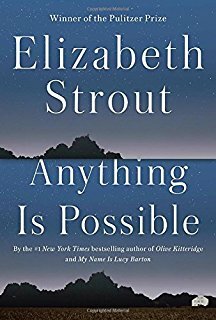 In listening to Strout’s approach to her characters, it strikes me now that a lot of this manufactured melodrama is based on judgment. In each scenario, the creator is judging the others, whether they be co-workers, family or neighbors. It is a battle of good vs. evil, and the creator is always the good, the righteous. There must be winners and losers. Sometimes the co-workers, family or neighbors aren’t even aware they are engaged in the turmoil. So true, Susan! The world would be a better place if we could suspend judgment and turn down the drama!